Punkin is progressing at a steady pace despite the fact that Kim and I have not been able to work with him every day. As a Jue Yin(Wood/Fire) horse temperament, Punkin does not really need a daily work routine. He is quite happy when he gets attention and just as happy when he is left alone in the pasture with his new buddies. Punkin is now so easy to catch that we can walk right up to him anytime in the pasture and put the halter on. Since he is such a good boy he can now be out with the 2 geldings, Remi and Cooper. Punkin moved right into second place in the herd but he is not aggressive. I just stand by Cooper until he finishes eating because Punkin gets significantly less food. Punkin is so much more relaxed and I have changed his feeding program to match his current needs. When he first came I gave him the Digestive Product KLPP, daily and 2 Eleviv twice a day to help him handle the stress of moving. He also received 3 tablets of bluegreen algae without the cell wall to help him focus on his new training. Now Punkin gets his cup of senior feed twice a day and 1 tsp of powdered bluegreen algae with probiotics once a day. He is on some grass and coastal hay. The extra supplements for Punkin, when he first arrived, made a huge difference. He was an ulcer case for sure because he was so upset and stress is one of the main causes of horse ulcers. His manure was loose and his appetite was off. After a few days of the extra digestive and nervous system support, Punkin started eating better and his manure returned to normal. He also became less tense and his ability to learn improved dramatically. We have not ridden Punkin but I have stepped up in the stirrups. He is very good about this. I am taking my time to make sure that when he moves off for the first time with me aboard that he can stay relaxed. As a reactive Jue Yin, Punkin is still a bit quick to break into a fast trot when he is being worked in a circle on the end of the lead. I want him to think about more bending and feeling back to me rather than rushing off when he gets nervous. Another concern is keeping the saddle on. 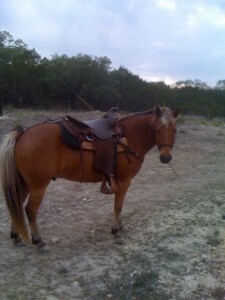 Punkin is built like a 55 gallon drum and even with a breast collar and crupper the saddle wants to roll on his back. We are still experimenting with different pads but the saddle is a good fit. As we work Punkin more on bending and supplying I think his withers will become more prominent so they can help keep the saddle in place. This entry was posted in Colic in Horses, Feeding Horses, Five Element Feeding, Five Element Personality Typing, Five Element Training, General Horse Care, Horse Health Care, Horse Ulcers and tagged causes of horse ulcers, horse temperament on June 13, 2011 by Madalyn Ward, DVM.